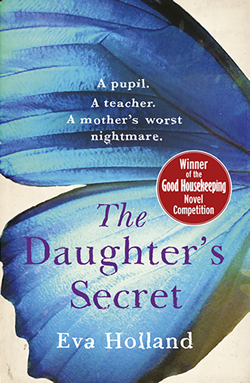 To celebrate the publication of The Daughter's Secret today (13 August 2015), I'm excited to share with you a guest post from author Eva Holland! Have you always wondered where the magic of creating a gripping read happens? Or are you just a tad curious and want to snoop around her work space? 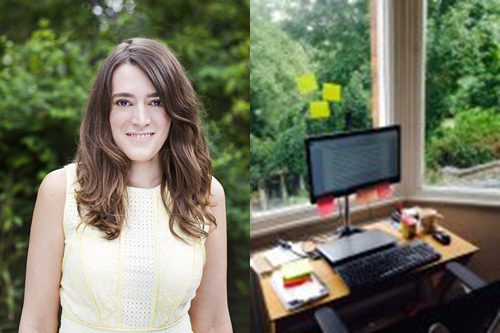 Look no further, as Eva shares where she writes and what her routine is! "My desk is wedged into the bay window of the spare bedroom. It is the perfect writing space for me – far enough away from the distractions of books and people downstairs and right next door to my bedroom so I can shuffle to it in my pyjamas as soon as I wake up. "I’ve always been messy and my desk in no exception. I envy writers who have orderly systems for recording their thoughts in notebooks. I just scribble on or in whatever I have to hand. As result my desk is a mess of notebooks, old envelopes and Post It notes covered in my scrawl. Apart from my notes, the only thing I must have on my desk when I write is a frequently refilled cup of coffee. "My writing routine is very simple: I start as early as I can and I always unplug my modem. The internet is an amazing thing but I have no ability to focus on my work in progress if I could be reading the whole of Wikipedia instead!" Blurb: When Rosalind's fifteen-year-old daughter, Stephanie, ran away with her teacher, this ordinary family became something it had never asked to be. Their lives held up to scrutiny in the centre of a major police investigation, the Simms were headline news while Stephanie was missing with a man who was risking everything. Now, six years on, Ros takes a call that will change their lives all over again. He's going to be released from prison. Years too early. In eleven days' time. As Temperley's release creeps ever closer, Ros is forced to confront the events that led them here, back to a place she thought she'd left behind, to questions she didn't want to answer. Why did she do it? Where does the blame lie? What happens next? The Daughter's Secret is out now and you can purchase your copy from Waterstones, Amazon.co.uk or your own preferred retailer.